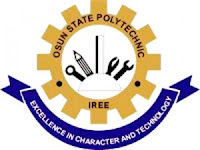 Osun State Polytechnic, Iree DPT acceptance fee for 2016/2017 academic session has been announced. Those who have verified their names on the released OSPOLY Daily Part-time admission list for the session are to pay acceptance fee. They are to pay the non-refundable acceptance fee specified by the management. This signifies that candidates are willing to accept the offer of admission. Those who do not pay the acceptance fee forfeit admission offers to them.